Dave reminded me I didn't post this after our Gas Works Park crawl! Put it up on Flickr and forgot. Here's my favorite from last week's trip to Vancouver BC too, the rail yards from the convention center. Look forward to seeing you all at the locks! 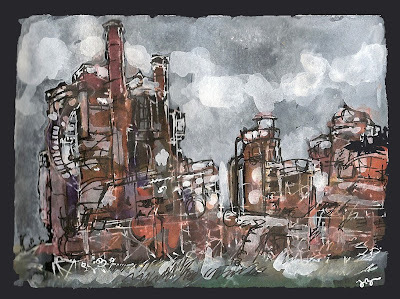 I like the black background and treatment of the gasworks image - really conveys the feeling of texture of the place. Beth - Your Gas Works sketch on black is a favorite. Movement almost Tobey-sk. Oh but the best thing was sitting at the other end of the bench from Beth as she worked on her sketch of the railyards in Vancouver BC. It was a truly glorious afternoon!